Fabric technologies have now become a recurrent featuring in our comparison reviews, typically put against Gore-Tex, which is regarded as the top fabric technology in the market. 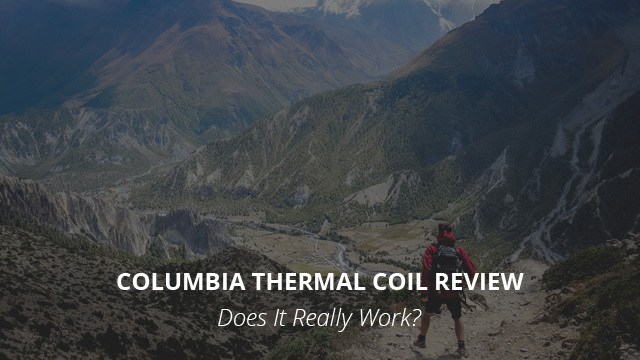 A technology that we have yet to see in any of our reviews, selections or comparisons is the Thermal Coil technology by Columbia Sportswear. Columbia is an American brand that was established in 1938 and is one of the most renowned brands currently on the market of outdoor sportswear. They are very well-known for their affordable prices and quality products, in particular the jacket designs. You can find several recommendations on our site. This is a brand that we have featured extensively in our selections and have also reviewed the OutDry technology that the brand uses in many of its products, as well as Omni-Tech, a technology developed by the brand itself. They are also renowned for other technologies, which include the Omni-Heat and Omni-Shield ones. As we mentioned before, and as the title indicates, our focus today is on the Thermal Coil technology, one of the brand’s older technologies. We will be looking at its features and how it works as a technology and we will also quickly take a look at how it compares to the other technologies that Columbia uses in their products. 2. Thermal Coil: How Does It Work? 4. Thermal Coil: Is It Any Good? Does It Really Work? Fabric technologies are specialized fabrics that are used for specific purposes. Some are made to be more breathable, others to provide better weather protection and, in the case of Thermal Coil, to provide maximum warmth while at the same time being breathable. Typically they are made of a Polyester or Nylon laminate, where the specialized membrane is put between the two fabric layers. Fabric technologies are also more durable than typical fabrics, as they are not solely made for high performance but also longevity. This is also in part due to their prices, since jackets and other clothing that use such fabrics are sometimes costly. The Thermal Coil technology is a technology that consists of a fabric with silver coils printed on its surface. While there are fabrics that insulate well on their own, such as polyester fleece or wool, a technology like Thermal Coil has an upgraded insulating performance. The silver coils work as small heat reflectors and they are able to reflect the heat that is generated by the body. By doing so it helps maintain a constant temperature within the garment as the coils are constantly reflecting body heat back at it. It’s for this reason that these silver coils are printed on the inside of the fabric. In terms of wear, this is a very lightweight material, which barely affects the overall weight of the garment. It is also mildly breathable, thus allowing moisture build up from within the garment to get out and helping to prevent excessive sweating from overheating. The video below by Kohl’s gives a short and comprehensive rundown of the Thermal Coil technology. We want to take a quick look at these two technologies together as they are very similar and, as a matter of fact, Omni-Heat is the technology that in a way replaced Thermal Coil. This is the reason why you might not be familiar with Thermal Coil and will not come across many jackets or garments that utilize it. Omni-Heat is a technology patented by Columbia, which is considerably more breathable than Thermal Coil and it works similarly. Instead of silver coils printed on the fabric, Omni-Heat utilizes small silver dots that cover nearly 35% of the fabric space. Similarly to Thermal Coil it, too, is used on the inside of the garments where it is able to quickly and efficiently reflect body heat. Their main differences are the silver coil usage as opposed to silver dots, and most importantly the breathability. This is the main reason why Omni-Heat is the one used nowadays by Columbia in a lot of their jackets, gloves, footwear and other clothing. It allows for better moisture wicking and it makes for a more comfortable garment overall. You will often find us being on the fence when it comes to questions like these when we compare fabric technologies. The reason for that is simple, because a straightforward and decisive answer is not really for us to give since we don’t know for certain what it is that you are expecting from a fabric technology. Another reason is that the performance of a fabric technology is also dependent on a particular jacket’s or garment’s design, so it wouldn’t be very objective of us to give a concrete answer. In this case, however, the answer in short is “Yes”. As a fabric technology on its own, Thermal Coil works perfectly fine. It is great at reflecting warmth, so it insulates quite well and the fact that it is so lightweight makes it quite comfortable. However, it is not the most breathable so that should be kept in mind if you are looking to purchase a jacket that utilizes this technology. Well, since we have now established that this technology does indeed work, let’s take a look at two jackets that rely on it to provide insulation. The first jacket is the Winterswept design, which is made not only of the Thermal Coil technology, but it also utilizes the Omni-Shield technology, which works as a fabric protector by preventing staining and also protects against the elements as it is waterproof. 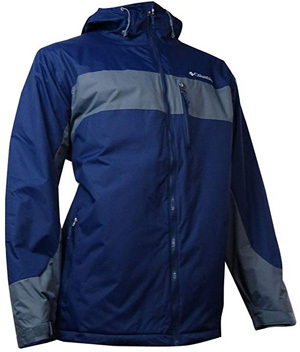 This jacket is lightly padded with 100G synthetic padding that further insulates, but it does not add bulk. It comes with a hooded collar, which is adjustable on the sides with draw cords and with Velcro fasteners on the sleeve cuffs. There are three pockets on the outside, two on the sides and one on the chest, which close up with zippers. The shell is made of Nylon and it comes in three colors: Pond 494, Marine blue and Navy grey. The second jacket is for women and it’s the Sparks Lake design, which comes with a Nylon shell and Polyester lining. 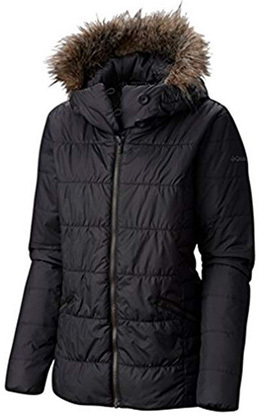 It has a hooded collar, which is lined with detachable faux fur trim that protects the face and adds to the look of this jacket. There are two side pockets on the outside and regular sleeve cuffs. It utilizes the Thermal Coil technology for insulation and it comes in a quilted design. There are two colors available: Black and Purple Dahlia. Overall, Thermal Coil is a functional technology that provides great insulation thanks to its silver coils, but it is not the best option for those looking for a fabric technology to wear on the trail. It is, however, suitable for daily wear, especially if you live in dry and cold areas.